Amma celebrated Holi with her children in Kochi. She distributed prasad, had satsang, jokes, bhajans and played Holi to the delight of all the devotees assembled there. Amma’s second leg of Bharata Yatra kicked off with the Ernakulam program, following on the heels of Amma’s visits to Reunion Island, Mauritius and Singapore. 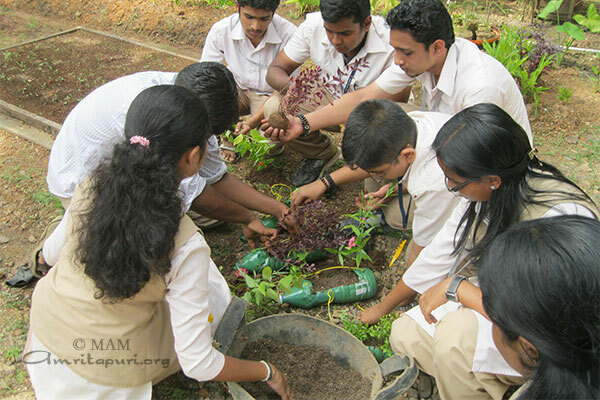 A unique feature of the Ernakulam program is that it is held near to Amma’s AIMS Hospital and Medical College, and is actually held on the campus of Amrita University’s School of Arts and Sciences. Therefore, there are a great number of students, devotees and sevaites in the area, and all come together for the programs. There is a pervasive and beautiful feeling of seva and love throughout. The day Amma arrived, some of the tour group members prepared dinner and brought it to the roof of Amma’s school, expecting Amma to come up to the roof and serve the tour group. However the school grounds were filled to overflowing with devotees overcome with devotional fervor. By turns they were chanting archanas and singing bhajans with great enthusiasm. 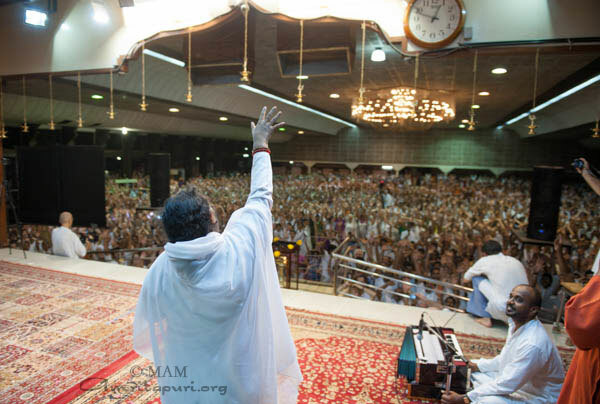 When Amma emerged from her room, she began to make her way to the roof but soon she turned around made her way down, directly into throng of devotees sanding below. She walked through the crowd and onto the stage, which was still under construction getting ready for the following day’s program. The tour group scrambled to catch up with Amma, carrying all the many pots of food from the roof of the school down the four flights to the ground and then onto the stage. Within seconds, Amma was serving food to the gathered throngs. Many wondered that if they were witnessing a quiet miracle. After all, the devotees had been expected only for the following day, and the food had been prepared only for the tour group. 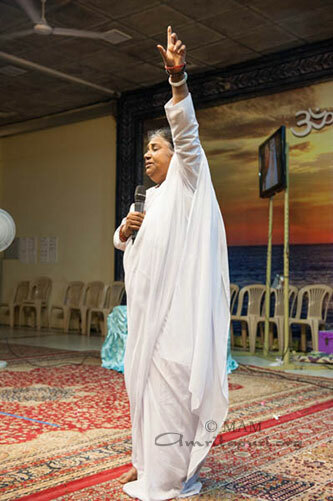 However, even though the darshan hall was filled to overflowing, and Amma’s serving seemed to go on forever as plate after plate passed lovingly through her hands, each and every person got a full plate of prasad – kanji, curry, lime pickle and a fresh chapatti. 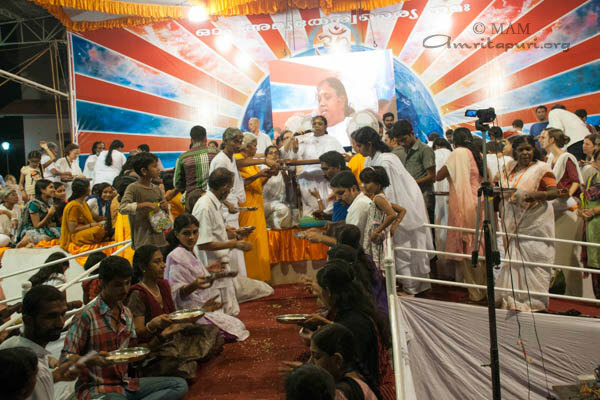 After distributing Prasad and praying together with her children, Amma proceeded to talk casually with her children, creating an intimate family atmosphere. She also passed a microphone into the crowd and asked her children to share jokes and stories with a spiritual message. 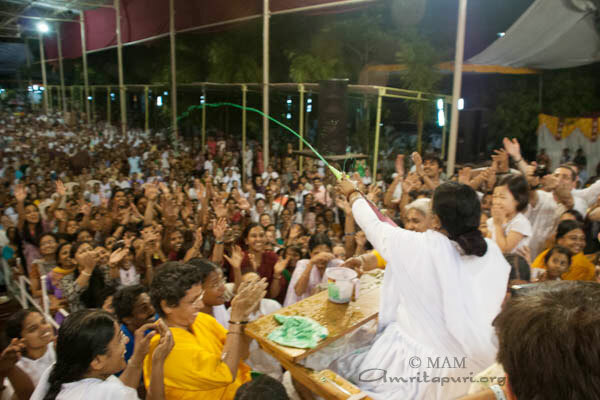 Then Amma began to sing, wrapping with ‘Aye He Holi’ and joyfully celebrating Holi with her children, playfully spraying colored water onto her children, and… getting plenty on herself in the process. On Amma’s 59th birthday celebrations in September 2012, the InDeed Campaign for Nature was launched. This is an online campaign to inspire people to pledge to take any one of six steps to help restore nature’s harmony. Many students made pledges to conserve water, grow organic vegetables, reduce their carbon footprint and more. 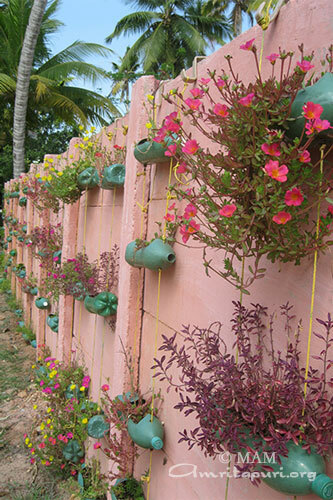 In order to keep their commitments, a group of Amrita University students created a unique “hanging bottle garden” – a hanging flower garden using recycled bottles as receptacles for the flowers. 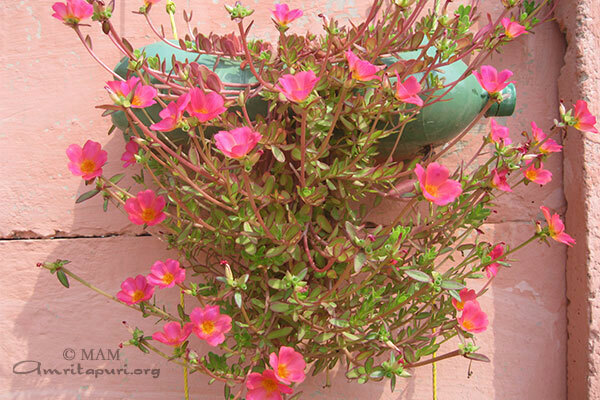 The bottle garden is a 36-meter stretch of Jasmine, Lantana, Browallia, Lily, Tabernaemontana, Duranta, many types of Portulaca grandiflora (table rose), Ixora Miniature, and Springaria – all flourishing in recycled bottles hanging neatly in 4 rows and 48 columns long the walls near the mess hall in Amrita University’s Amritapuri campus. “We are very happy that we could do something which Amma likes and want us to do along with our studies.” says Trayesh, a first year student of enginering. This beautiful garden is the result of the tireless efforts of students who served an hour every week for a moth in December 2012. “We are proud of ourselves for doing something to love and preserve nature. 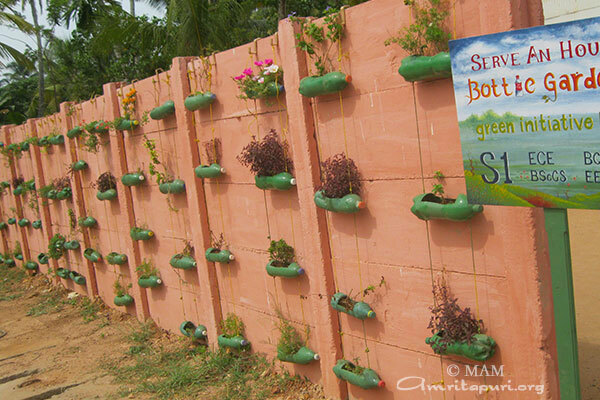 I am really satisfied and happy seeing the bottle garden in the campus now” says Keerthi, another first year student. The Amritapuri campus offers a 6-month ‘Serve an Hour’ course focusing on developing an attitude of selfless service among Amrita students. The course emphasizes student learning through hands-on service projects. 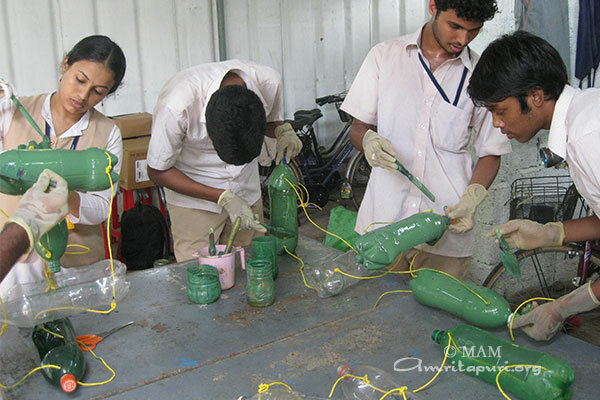 The course also offers opportunities for students to collaborate in creative learning opportunities with students at government schools in rural areas through school visits and educational outreach activities. Last semester, after a brainstorming session, one team of students decided to design and install a hanging flower garden on campus. First, they collected the empty bottles from the recycling center. They now had to cut the bottles, drill holes, paint them, hang them in rows, and fill them with potting mixture in order to make them ready for planting. They worked with their faculty advisor and decided to pool in the efforts of all the students taking the Serve-an-Hour course. Making a list of supplies, developing a budget, deciding on the design for the flower garden, contacting the nursery for saplings and getting the saplings to campus – all this was part of the process but the team finally had everything together. “We never thought that it would be one of the most wonderful experiences we would have at Amrita. It was nice to involve in some work which help to prevent pollution and preserve nature.” said Aswathy Nair one of the student volunteers of this InDeed campaign. 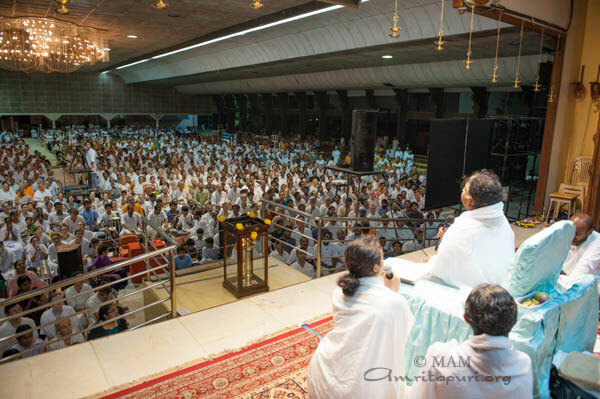 Amma to visit Tokyo, Japan on May 20-22 and the American continent from 24 May to 18 July 2013. More details will follow. Rajeswar Purryag, the President of the Republic of Mauritius, along with Vice Prime Minister Xavier Luc Duval, leader of opposition Alan Ganoo, the High Commissioner of India to Mauritius TP Sitaram and the Minister for Social Empowerment Suren Dayal shared the dias with Amma during her visit to Mauritius. In a colorful evening function, President Purryag launched the Amrita Nidhi pension scheme in Mauritius under the auspices of MA Center Mauritius. The President commented that Amma is truly a messenger of peace and love and through her travels, spreading it all over the world. On behalf of the people of Mauritius, he thanked Amma for her visit and the charitable activities that are being carried out by her Center in Mauritius. 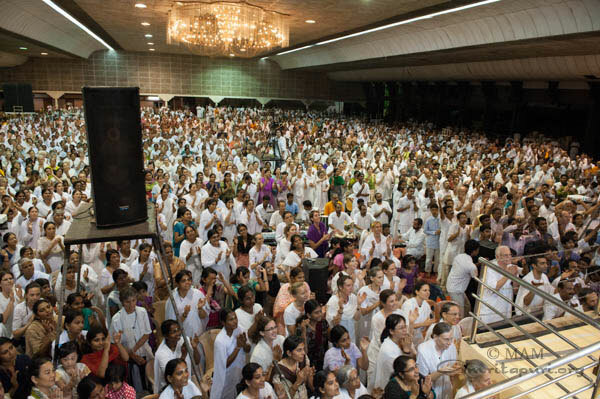 As Amma’s darshan was finishing, Amma’s message for Shivaratri was played on the big screens in the hall. 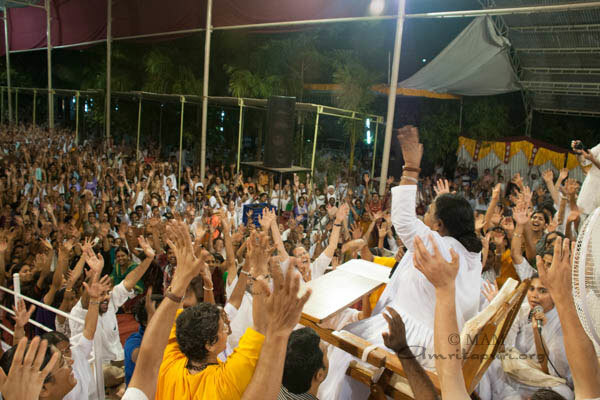 At the end of darshan Amma started singing “Mano Buddhyahamkara Chittani Naham”. It was very moving. Many were in tears. Her innocent voice, the bhava of yearning for God were touching the hearts of thousands assembled. Then she sang ‘Hari Om Namah Shivaya’, and Parama Shiva Maam Pahi. 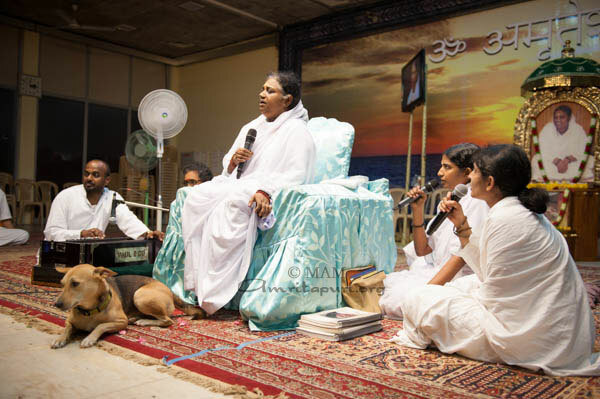 During one of these bhajans, the ashram dog – Bhakti – made her way to the stage and lay at the feet of Amma. Amma was smiling at her in between the singing. Afterwards she asked everyone to stand up and dance and to the tune of ‘Bolo Bolo Sab Mil Bolo’. Every one was dancing for a long time. But Amma was not done. She continued to sing one more bhajan – Hari Om Namo Narayanaya. At the end she called out Hara Hara Mahadeva, and Jai Bolo Mahadeva Shambo ki-Jai! Amma to visit Reunion, Mauritius & Singapore from 15 to 26th March. She will hold program -Satsang, Bhajan & Darshan- in all the three countries. Devi Bhava on 25th, No program on 26th, Additional program on 27th.